Peter Sagan took his third stage win at the 2018 Tour de France, having recovered well from the difficult days in the mountains. In the transition stage following three Alpine stages, the world champion of Bora-hansgrohe outsprinted Alexander Kristoff and Arnaud Demare to take yet another victory at this Tour. "This stage was a piece of gold for us I think," the rider said. "It's fantastic, and a flat stage that allowed everybody in the group to recover a little bit. I think everybody is happy to have had a more relaxed stage. "In the end I'm very happy to have won today. It's very nice for me and thanks to all my teammates because they again did a very good job." Sagan didn't think he timed the sprint that well, even though it was good enough to take the win. "A little bit late," he explained. "I was a little bit behind in the last 600 meters. In the last climb I tried to bring myself to the front and after that I just stayed in the wheel of Kristoff and I am very happy to beat them." 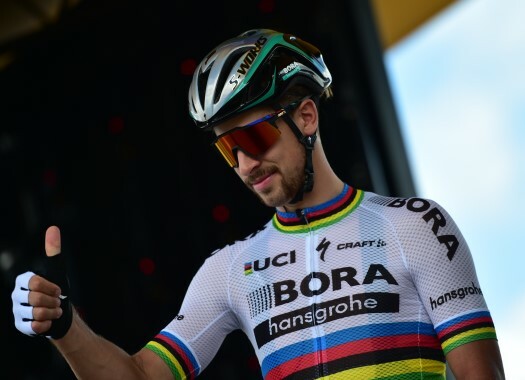 In the battle for the Green Jersey, and given the departure of most of the top sprinters from this Tour de France, there seems to be no real threat left to Sagan. However, the Slovak refuses to celebrate just yet. "It's still important to get to Paris," he affirmed.